Shooting of the most talked about film '2.0' has come to an end and the film is expected to be released on Diwali this year. The trailer of the film 2.0 will be out on 29 September which is just a month before its grand release on 18 October. 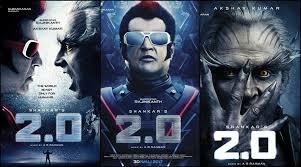 Rajinikanth and Amy Jackson are in lead roles of film 2.0 and Bollywood actor Akshay Kumar for the first time will be seen playing the role of a villain in the film. The 400 crore budget film will be released in English, Hindi, Tamil, Telugu, Chinese and Japanese. The teaser will be out on 14 April.